edited and annotated by Patrick Samway, SJ. University of Notre Dame Press (Notre Dame, Indiana). As published, the complete letters of Father Thomas Merton (1915-1968) — the well known Trappist monk, author, social critic and poet — come to five hefty volumes. To read these, however, means to get only one side of the conversation. 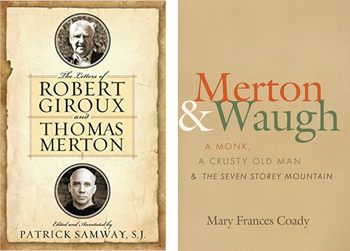 These two books give readers both sides of Father Merton’s written conversations with two of his more prominent correspondents, editor Robert Giroux (1914-2008) and English novelist Evelyn Waugh (1903-1966). Giroux and Father Merton first met when both were students at Columbia University in the late 1930s. This volume of their letters begins with one from Giroux dated March 8, 1948, as the manuscript of Father Merton’s autobiography, “The Seven Storey Mountain,” was being revised and prepared for publication. At this time Giroux was Father Merton’s editor at Harcourt, Brace & Co., a major New York publishing house. This book would go on to become a mega-bestseller and make Father Merton one of the most influential Catholic authors of the 20th century. Later in life, he would express regret that his autobiography included a kind of naive piety and a romanticized portrayal of monastic life. Still, “The Seven Storey Mountain” remains a classic that has never been out of print. The reader soon discovers that “The Letters of Robert Giroux and Thomas Merton” is almost entirely taken up with conversations having to do with writing, convoluted editorial processes, and discussions of issues related to the censorship of Father Merton’s writings. Giroux edited and/or published no less than 26 of the priest’s books, and — one particularly noteworthy theme of the book — in virtually every case Father Merton’s religious order, the Trappists, required that the book be approved by the order’s censors. These were fellow monks considered qualified to determine whether anything in a manuscript might be theologically “inappropriate” or cast a negative light on the order. While today many may be perplexed by this, Father Merton’s complete and humble acquiescence to this process deserves attention. While he sometimes grumbled about it, there seems never to have been any question in Father Merton’s mind that his vow of obedience required him to accept the will of his superiors in this and other matters as equivalent to the will of God. The monk was always willing to admit that he could be wrong. In this, Father Merton was not alone. Prominent theologians of the 1950s and ’60s, such as Jesuit Fathers Karl Rahner and Pierre Teilhard de Chardin and Redemptorist Father Bernhard Haring, to name a few, were “silenced” by Vatican authorities, and all obeyed, only to be later vindicated. Such obedience was understood as an act of humility and courage and a rejection of sinful pride. Today, on the contrary, frequently the assumption seems to be that in similar circumstances it is an act of humility and courage to disobey, sometimes to the point of leaving one’s religious order and even abandoning the church entirely rather than acquiesce. Indeed, so common is this assumption today that not only prominent Catholic thinkers and activists, but ordinary Catholics sometimes abandon being Catholic because, in effect, church authorities do not embrace a particular theological ideology, whether “conservative” or “liberal.” The last thing such individuals seem willing to admit is that they could be wrong. This is a remarkable and thought-provoking, largely post-Second Vatican Council, development and a noteworthy transformation in a common understanding of the nature, role and formation of individual conscience. For this reason alone, then, it would be a mistake to disregard “The Letters of Robert Giroux and Thomas Merton” as little more than a collection of old letters about the world of authorship and publication during the 1940s, ’50s and ’60s. Father Samway’s introduction, footnotes and epilogue enrich the book beautifully. Turning to Father Merton’s correspondence with Evelyn Waugh (1903-1966), the two men — both of whom left the Anglican Church for Catholicism as adults — wrote these letters between July 1948 and February 1952. Waugh agreed to edit the American edition of “The Seven Storey Mountain” for British readers, and this version appeared in 1949 with the title changed to “Elected Silence.” Father Merton wrote 13 of the letters in this book, Waugh wrote seven. Editor Mary Frances Coady contributes a prefatory editor’s note, an Introduction and eight commentaries that shed welcome light on the letters themselves. In this compact volume we find the young Merton prior to, during and just after the publication of his autobiography. Twelve years older than Merton, and already a hugely successful novelist, the Waugh of these letters appears as something of a mentor to the younger man. Father Merton expresses gratitude to Waugh for skillful editing of his work, and Waugh appears as both a big fan of Father Merton and a more experienced writer who is willing to share constructive criticism. Finley is the author of more than 30 books on Catholic themes including “Key Moments in Church History” (Sheed & Ward), “The Joy of Being a Eucharistic Minister” (Resurrection Press) and “The Rosary Handbook: A Guide for Newcomers, Old-Timers, and Those In Between” (Word Among Us Press).